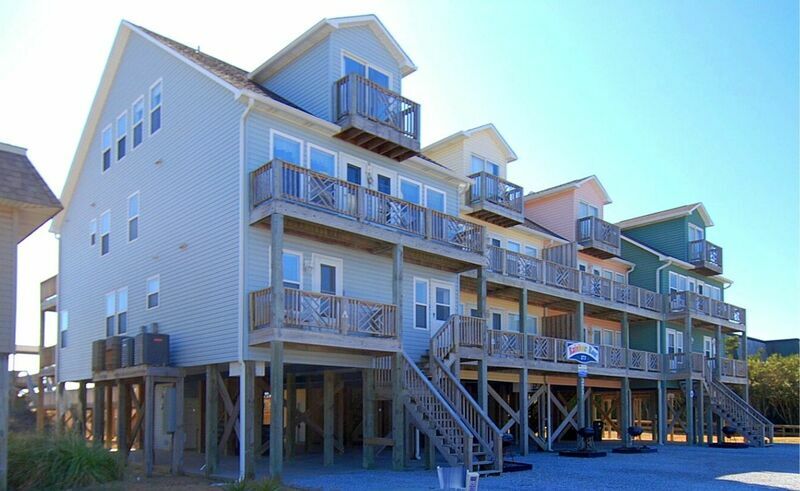 Oceanfront 7 bedroom 7.5 bath townhouse with large shared POOL in 4 unit quadplex. "Rainbow Row" complex located on the desirable west end of the island. Amenities include 3 televisions, stereo, 2 DVD players, wireless internet access, Netflix access, unlimited domestic long distance, ceiling fans, fully equipped kitchen with dishwasher, Keurig, microwave, small appliances. Wet bar with wine cooler. Washer/Dryer. Master Bedroom has oceanfront deck. Large sundecks and covered porch. Outside shower, Charcoal grill. All beds will be made and bath towel sets included in rental rate. "Rainbow Row" Quadplex, Unit A. Non-smoking and no pets allowed. Sleeps 16 1st Flr: Q w/private BA, Q w/private BA. 2nd Flr: K w/private BA & whirlpool tub, 2 Twin w/private bath, Q w/private bath, Q w/private bath. 3rd Flr: Q, QSS, full bath is shared. This week has been outstanding. Unit a of Rainbow Row was super nice, spacious, clean, comfortable and well equipped for all of our needs. There are even spices in the cabinet. The beds were also comfortable. I suppose if I wanted to be picky about anything, I would say a few more pillows would be nice and TVs in all of the bedrooms would be a plus. Netflix was an added surprise. The beach is a hop and skip away from the front porch. Oh, did I mention how much we all loved sitting on the front porch with the breeze blowing?? Having a washing machine and dryer was also great. No dirty clothes after a long ride home. None of the other units had been rented our week, so we felt like we had a private pool all to ourselves. There's also a clothes line on the front porch to hang wet clothes and towels. This home felt like a home away from home and we will surely come back. Thank you for meeting our expectations.